This post should have really come up a couple of days ago as the actual quarter of the IPL is at 14 group matches, but Dubai Sports City was keeping me busy. Here are my quarterly reports from last season: Q1, Q2, Q3, Q4. This update comes after 18 of the group matches have been played with half the teams appearing in 5 games each and the other half in 4. Some games have been washed out so all the batsmen, except those from Bangalore Royal Challengers (5) and Mumbai Indians (3) have had 4 innings each. Hayden has been in smashing form this season stroking 2 fifties in his 4 innings and scoring at a strike rate of almost 163. In fact, Hayden was in similar form last season as well and at this stage (end of Q1), he was the second highest run scorer behind Brendon McCullum. Hayden had an impact in only a handful games last year. His availability for the entire tournament this time round could land him the Orange Cap that Shaun Marsh took home in 2008.
Who said 20-20 was a game for the younger ones? Both members of the Deccan Chargers opening pair are among the top 5 run scorers. No wonder they are the only unbeaten side thus far. Its taken them more than that though; as initially Symonds and later Rohit Sharma were among the leading run scorers at various stages of the league in 2008, yet they hardly managed to win a game. Sachin Tendulkar has been awesome. His partnership with Jayasuriya at the top of the order has set the IPL alight. By this time last year, Sachin had not appeared in any game; but this season he has ensured that Mumbai Indians get off to a flying start. Two 50s, a strike rate of 130+, and flowing strokeplay has resulted in a petition that wants Sachin to be a part of the World 20-20! AB De Villiers walked into the IPL on the back of a very strong season for South Africa; he has continued the same form for the Delhi Daredevils. He is the only centurion this season and has the 3rd highest strike rate among all batsmen that have scored more than a 100 runs. Unlike last year, McCullum, Sharma, Raina, Sehwag, and Gambhir have not got going yet. While much was expected of Kevin Pietersen, who is the most expensive player in the IPL, but all he has managed is a mere 80 runs in 5 innings with a best of 37. Malinga has no doubt been the pick of the bowlers, managing those 9 wickets in only 3 matches. He has bowled with pace making early breakthroughs for Mumbai and also striking late blows with brilliant fast bowling. He has been a sight. RP Singh was amongst the highest wicket takers in IPL 2008, as was Pragyan Ojha, and both of them have scripted the Chargers' success this season along with their opening pair and Fidel Edwards. Yusuf Abdullah is enjoying his home conditions and looks extremely lively. Much more than what his run up and action suggest. He's much quicker and surely makes Priety smile. Munaf Patel, similar to last year, is looking lethal under Warne. He has bowled some unplayable deliveries and has picked up wickets regularly. If only Warne could captain India; they would have a three-pronged quality pace attack! Deccan Chargers, undoubtedly, have been the dominant team in the IPL winning all their games, which is already double the number of matches they won in 2008! I'm not sure if sports betting is legal in South Africa, but if I was a gambler, my money would be on the Chargers. It would have been last year as well given the team they had, but this season they are truly displaying their worth and potential. Speaking of betting, any idea why Lalit Modi may have said no to the services of the ICC's Anti Corruption Unit? Does the IPL have its own unit? Is the IPL immune to corruption? Is there no betting taking place on IPL matches? Is Modi indulging in some IPL cricket betting? Which one is it Lalit? 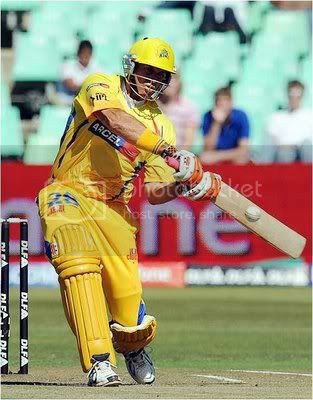 Highest Team Score: 189-5, DDD vs CSK. Highest Individual Score: 105*, AB De Villiers (DDD) vs CSK. Best Strike Rate (min 100 runs): 171.57, Adam Gilchrist (DC). Most Sixes: 11, Adam Gilchrist (DC). Best Bowling Performance: 5-5, Anil Kumble (BRC) vs RR. Best Economy Rate (min 8 overs): 4.35, Lasith Malinga (MI). This year the scores have been generally lower than they were in IPL 2008. That might have something to do with the pitches in South Africa, but despite the relatively lower scores, the matches have been one sides besides just a few. Last season, there were many more closer matches, or is that just my imagination. Malinga is not only the highest wicket taker, but also has the best economy rate - that is saying something for a fast bowler. Who says 20-20 is not a game for the pacers? Anil Kumble's 5-5 was pure magic and it was a great sight to witness him with the purple cap along with Dravid with the Orange. Sadly that was short lived; as was Bangalore's winning start. I'll have the next update after the next 10 games so that I have the results of the first half, i.e. after 28 group matches. It will be interesting to see where these players stand then and how the first half of IPL 2009 compares with that of IPL 2008.